It is not known if this mark was used by William or John or both. 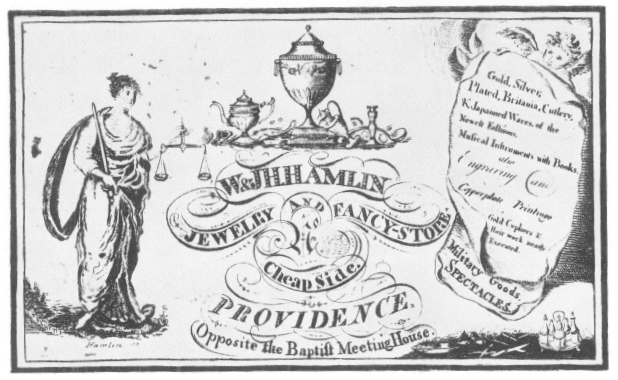 Advertised in the Silversmith and instrument maker (Providence RI), 1792-1809, with a shop on North Main Street, next north of St. John's Church (pre-1806), at 11 Cheapside, next door north of Messrs. Blodget and Powers (1806), and opposite the Baptist Meeting House (1809). He worked after 1820 as a silversmith and instrument maker in Providence RI with a shop at the Sign of the Quadrant, 135 South Main Street and later at 131 South Water. He built a reflecting telescope in 1826 and allowed public use, admission by tickets, examples of which survive. Telescope depicted on the ticket is signed 'Hamlin' and appears to be a Gregorian, alt / az mounted. This might be the first reflector fabricated in the U.S. He appeared on the 1850 census taken at Providence RI, listed as a mathmatical instrument maker.